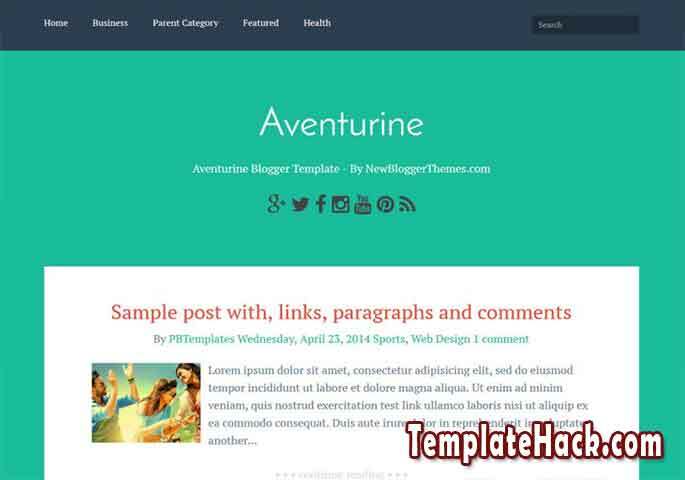 TemplateHack.com - Download Aventurine premium blogger template. Aventurine is best simple blogger template in the world. With minimalist but elegant design, green color base and less resource, your blog will load fastly using this blogspot template. It would be great to use on your magazine blog, health blog, personal blog, lifestyle blog, fashion blog, and any other niche blog that you have. It is responsive blogger template can load sucessfully on any screensize devices like desktop, smartphone, handphone and tablet. Simple, Green, Social bookmark ready, Post thumbnails, SEO Friendly, Navigation menu, Breadcrumbs, Responsive, 2 column, No sidebar, Fast loading, Green, White. Mobile friendly, Elegant, Minimalist.